Received: July 3, 2018; Revised: July 25, 2018; Accepted: July 30, 2018; Published online: March 15, 2019. Fig. 1. Operation field of Single-incision two-port laparoscopic appendectomy (SITPLA). (A) Trans-umbilical incision. The umbilicus was retracted for a full exposure and vertical incision was made on the bottom of umbilicus. (B) For prevention of extraperitoneal gas leakage, single suture & tie was done between two ports. (C) Minisite miniport or needle grasper introducer at suprapubic site. (D) 3M Steri-StripsTM was applied for extra-device puncture site instead of suture. Fig. 2. Calculated length of fascia incision for SITPLA using 5 mm-trocar with a diameter of 7.7 mm. 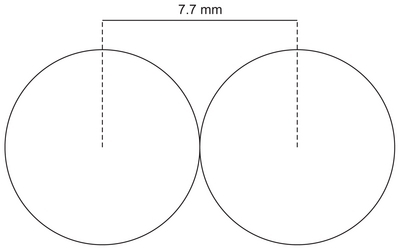 Expected incision size, (7.7π+15.4)/2≒ 19.79 mm; SITPLA, Single-incision two-port laparoscopic appendectomy. *Wound abscess, including clear or haemoserous discharge. Bhangu A, Soreide K, Di Saverio S, Assarsson JH, Drake FT. Acute appendicitis: modern understanding of pathogenesis, diagnosis, and management. Lancet 2015;386:1278-1287. Li X, Zhang J, Sang L, et al. Laparoscopic versus conventional appendectomy - a meta-analysis of randomized controlled trials. BMC Gastroenterology 2010;10:129. Yau KK, Siu WT, Tang CN, Yang GP, Li MK. Laparoscopic versus open appendectomy for complicated appendicitis. J Am Coll Surg 2007;205:60-65. Panait L, Bell RL, Duffy AJ, Roberts KE. Two-port laparoscopic appendectomy: minimizing the minimally invasive approach. J Surg Res 2009;153:167-171. Frutos MD, Abrisqueta J, Lujan J, Abellan I, Parrilla P. Randomized prospective study to compare laparoscopic appendectomy versus umbilical single-incision appendectomy. Ann Surg 2013;257:413-418. Hong TH, Kim HL, Lee YS, et al. Transumbilical single-port laparoscopic appendectomy (TUSPLA): scarless intracorporeal appendectomy. J Laparoendosc Adv Surg Tech A 2009;19:75-78. Lee J, Baek J, Kim W. Laparoscopic transumbilical single-port appendectomy: initial experience and comparison with three-port appendectomy. Surg Laparosc Endosc Percutan Tech 2010;20:100-103. St Peter SD, Adibe OO, Juang D, et al. Single incision versus standard 3-port laparoscopic appendectomy: a prospective randomized trial. Ann Surg 2011;254:586-590. Cai YL, Xiong XZ, Wu SJ, et al. Single-incision laparoscopic appendectomy vs conventional laparoscopic appendectomy: systematic review and meta-analysis. World J Gastroenterol 2013;19:5165-5173. Chow A, Purkayastha S, Nehme J, Darzi LA, Paraskeva P. Single incision laparoscopic surgery for appendicectomy: a retrospective comparative analysis. Surg Endosc 2010;24:2567-2574. Donmez T, Hut A, Avaroglu H, et al. Two-port laparoscopic appendectomy assisted with needle grasper comparison with conventional laparoscopic appendectomy. Ann Surg Treat Res 2016;91:59-65. Olijnyk JG, Pretto GG, da Costa Filho OP, Machado FK, Silva Chalub SR, Cavazzola LT. Two-port laparoscopic appendectomy as transition to laparoendoscopic single site surgery. J Minim Access Surg 2014;10:23-26. Pattanshetti VM, Krishna KL. Conventional laparoscopic appendectomy versus double-incision, three-port laparoscopic appendectomy: A 1-year randomized controlled trial. Asian J Endosc Surg 2018 Feb 19 [Epub]. DOI: 10.1111/ases.12467. Gomes CA, Sartelli M, Di Saverio S, et al. Acute appendicitis: proposal of a new comprehensive grading system based on clinical, imaging and laparoscopic findings. World J Emerg Surg 2015;10:60. Udwadia TE. Single-incision laparoscopic surgery: An overview. J Minim Access Surg 2011;7:1-2. Switzer NJ, Gill RS, Karmali S. The evolution of the appendectomy: from open to laparoscopic to single incision. Scientifica (Cairo) 2012;2012:895469. Kim HO, Yoo CH, Lee SR, et al. Pain after laparoscopic appendectomy: a comparison of transumbilical single-port and conventional laparoscopic surgery. J Korean Surg Soc 2012;82:172-178. Lee CH, Jeon WJ, Youn SJ, et al. The experience of transumbilical endoscopic appendectomies. Ann Surg Treat Res 2014;86:278-282. Lee JS, Choi YI, Lim SH, Hong TH. Transumbilical single port laparoscopic appendectomy using basic equipment: a comparison with the three ports method. J Korean Surg Soc 2012;83:212-217. Rammohan A, Jothishankar P, Manimaran AB, Naidu RM. 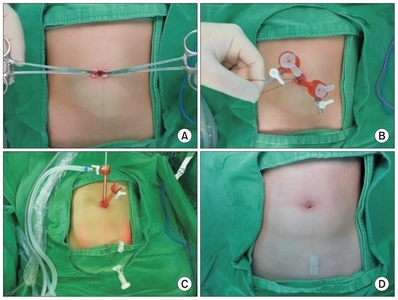 Two-port vs. three-port laparoscopic appendicectomy: A bridge to least invasive surgery. J Minim Access Surg 2012;8:140-144. Lin YY, Shabbir A, So JB. Laparoscopic appendectomy by residents: evaluating outcomes and learning curve. Surg Endosc 2010;24:125-130. Carter JT, Kaplan JA, Nguyen JN, Lin MY, Rogers SJ, Harris HW. A prospective, randomized controlled trial of single-incision laparoscopic vs conventional 3-port laparoscopic appendectomy for treatment of acute appendicitis. J Am Coll Surg 2014;218:950-959. Teoh AY, Chiu PW, Wong TC, et al. A double-blinded randomized controlled trial of laparoendoscopic single-site access versus conventional 3-port appendectomy. Ann Surg 2012;256:909-914. Lee WS, Choi ST, Lee JN, et al. Single-port laparoscopic appendectomy versus conventional laparoscopic appendectomy: a prospective randomized controlled study. Ann Surg 2013;257:214-218. Bhatia P, Sabharwal V, Kalhan S, John S, Deed JS, Khetan M. Single-incision multi-port laparoscopic appendectomy: How I do it. J Minim Access Surg 2011;7:28-32. Morita Y, Yamaguchi S, Ishii T, et al. Does transumbilical incision increase incisional hernia at the extraction site of laparoscopic anterior resection?. Am J Surg 2015;209:1048-1052. Tsuji Y, Maeda K, Ono S, Yanagisawa S, Baba K, Usui Y. A new paradigm of scarless abdominal surgery in children: transumbilical minimal incision surgery. J Pediatr Surg 2014;49:1605-1609. Yamamoto M, Tanaka K, Asakuma M, et al. Does Transumbilical Incision Influence Surgical Site Infection Rates of the Laparoscopic Sigmoidectomy and Anterior Resection? Am Surg 2015;81:1232-1236.